It’s a recurring theme in life: you don’t appreciate what you’ve got until you no longer have it. For me, I could say this about wrinkle-free skin (kids: wear sunscreen! ), having family within an hour’s drive, and fresh Pacific halibut. Growing up near Seattle, I never realized what a novelty and luxury this seemingly-ubiquitous white fish was. In fact, I never really sought it out, unless it was beer-battered and fried. Then I moved away. Then, during a visit home early one summer, my mom made this recipe from BC chef Karen Barnaby’s Pacific Passions cookbook. Whoa – what a revelation! Now I crave halibut but can almost never find it here in New Jersey. I find myself fervently scanning the fish counters about this time each year – awaiting, hoping for the arrival of some glistening white Alaskan halibut filets. Finally, just last week, I struck fish gold. 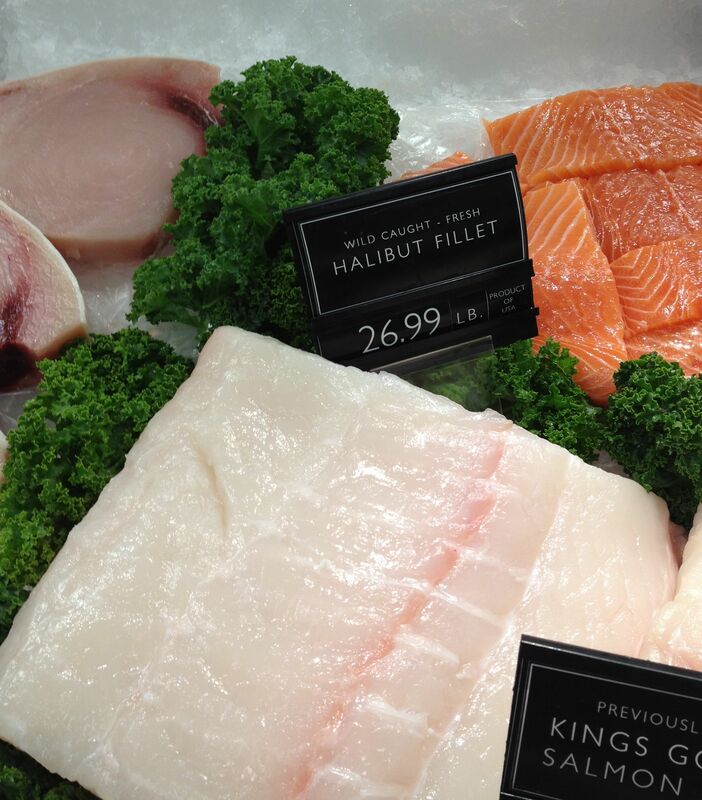 Alaskan halibut is a mild-tasting, lean and highly versatile fish. I had always assumed it was related to sea bass or grouper, but just recently learned it’s actually the largest member of the flounder family. While I’m still a fan of beer-battered halibut & chips, this recipe (adapted from Karen Barnaby’s) is a go-to for an easy yet restaurant-y (and to my surprise, kid-friendly) meal. At over $25 per pound, though, halibut is a bit (!) of a splurge. By some accounts, a portion of fish is supposed to be 4 ounces, so a pound and a half of halibut should yield 6 servings. (Karen’s recipe calls for 6-ounce portions.) Feel free to adjust the filet/portion size to your preference. If you’re looking to stretch the halibut into smaller portions (like I do), you could serve this with olive oil and garlic-tossed pasta or oven-baked “fries” (recipe below). Also note that you could make this crust topping for any white fish – just adjust the cooking time depending on the thickness of the filet. Heat oven to 425ºF. 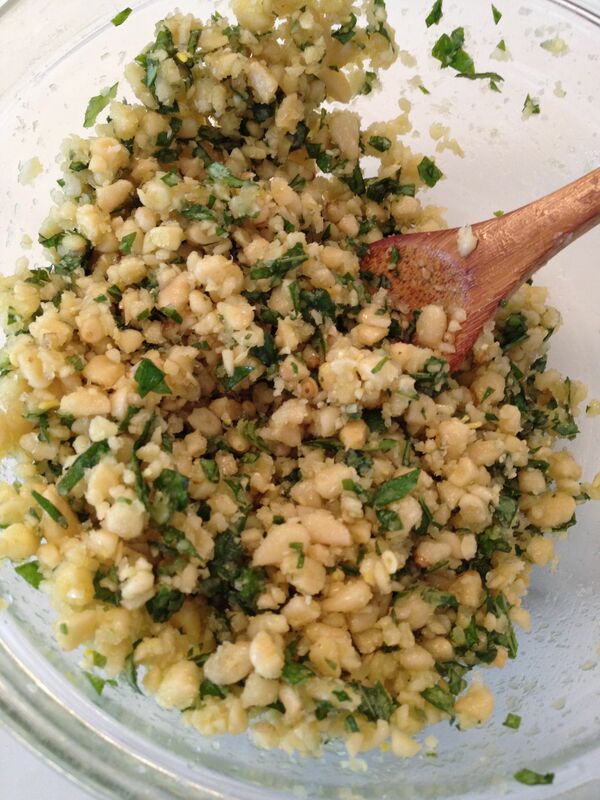 In a small bowl, combine chopped pine nuts, garlic, basil, parmesan cheese and olive oil. 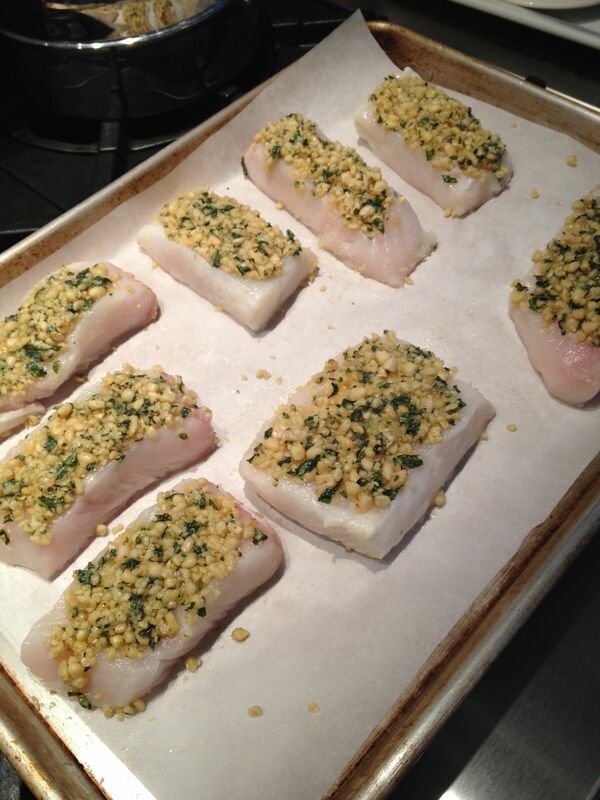 Cook these on the bottom rack of the oven while you’re preparing the fish. Make sure they’ve started to brown and are close to done before adding the fish to the oven. Heat oven to 425ºF. Wash potatoes and cut into thin (½” – ¾”) wedges. 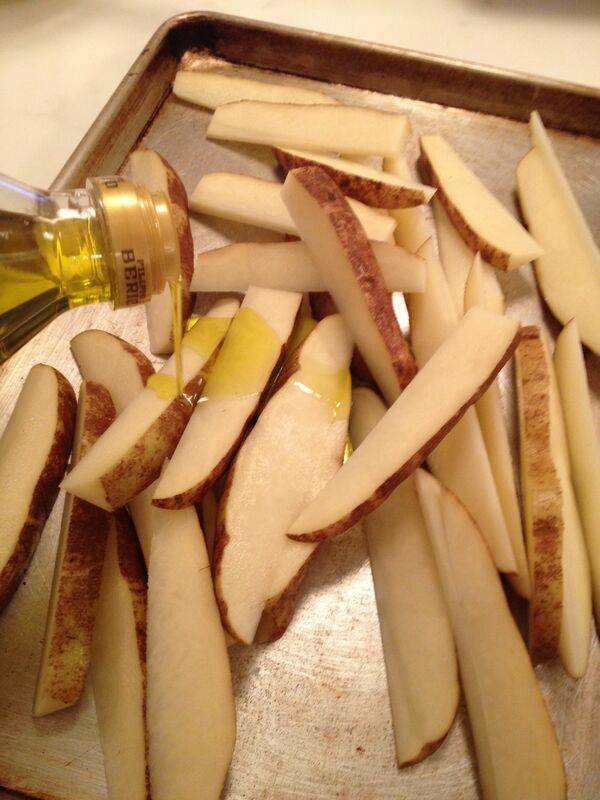 Mound onto a baking sheet and drizzle with olive oil. (Enough to coat all sides.) 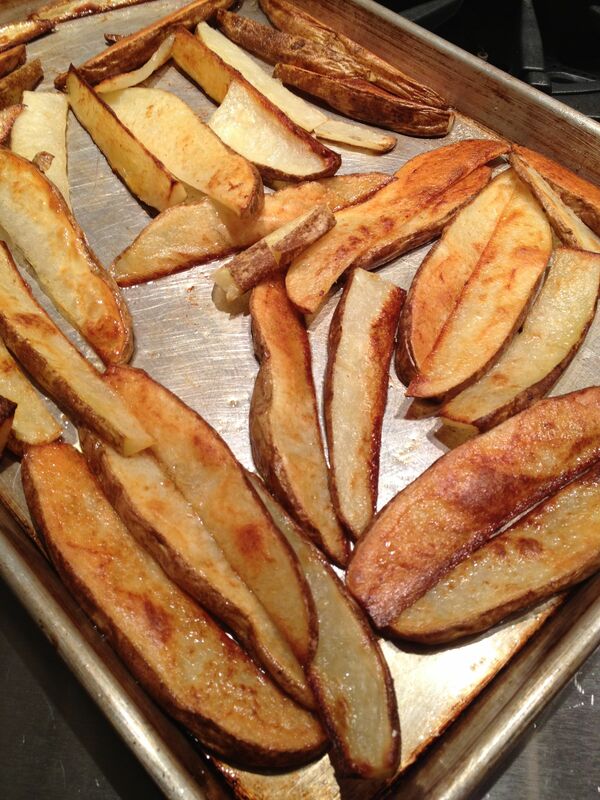 Loosely arrange in a single layer (using additional baking sheets if necessary) and sprinkle with kosher salt. Bake for 20 minutes or until starting to brown. Use a spatula to flip wedges. (Confession: this isn’t really necessary if you’ve used enough oil; all sides will brown, but the pan-side will be crisper.) Serve immediately, seasoning with more salt if necessary. 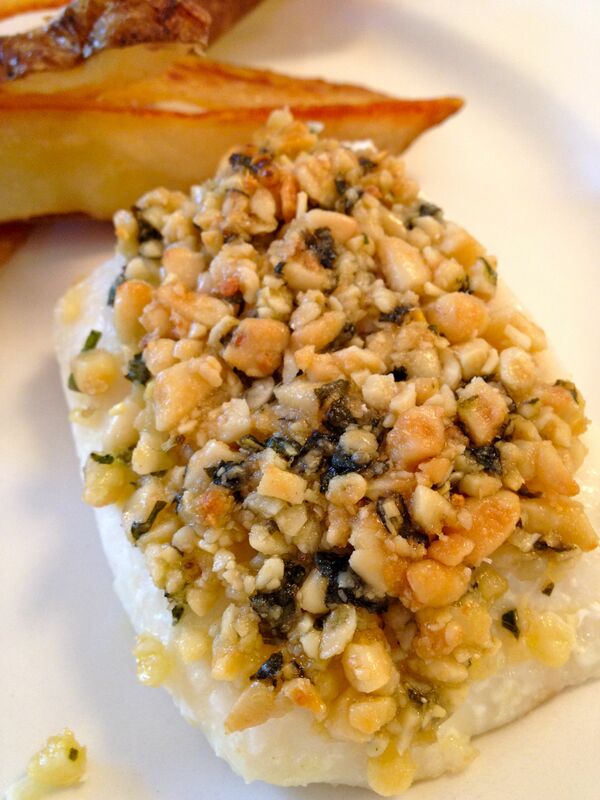 This entry was posted in Main Courses, Seafood and tagged baked fries, basil, halibut, parmesan, pine nuts by subeeskitchen. Bookmark the permalink. ca a l’air divin! ce soir c’etait cabillaud (cod) au cours bouillon (de france!) chez nous, la prochaine fois j’essaie avec ta recette. merci. yum! looks like a good one. thanks, sue. This is from “Gramma Bee,” SueBee’s mother: The halibut recipe from Karen Barnaby is a show-stopper. It holds well for awhile in the oven ( not too long! ), so if guests are late arriving, no problemo. 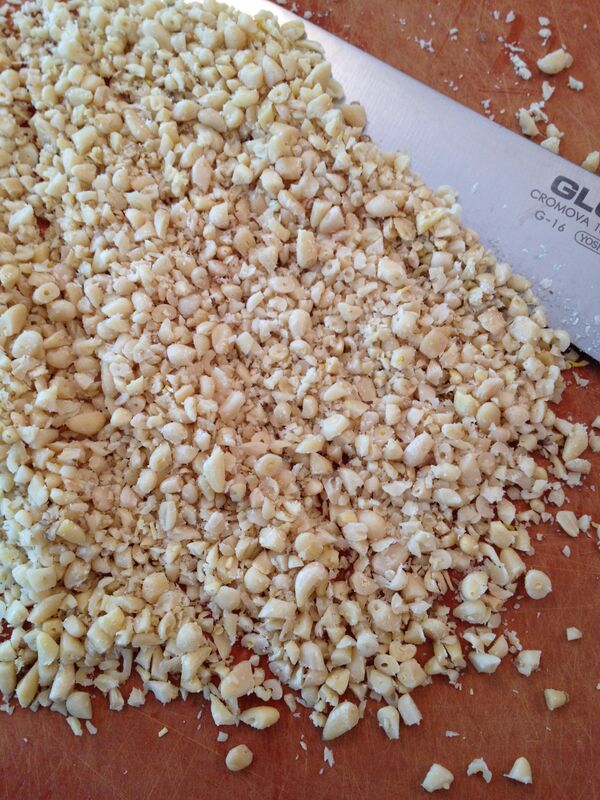 The pine nuts/olive oil combo helps hold in the juicy essence of the halibut so it does not dry out too quickly. By the way, we (Grampa Bee and I ) visited the Fish House in Vancouver, B.C. and met Karen. She is very charming and autographed her latest book for us. I identified myself as the chair of the “Tacoma Karen Barnaby Fan Club” and she therefore granted us special dispensation and a very tasty martini. I love her recipes b/c they frequently feature ingredients found in my own Northwest Washington garden and therefore I do not have to go to the store, but still can create a tasty meal! Thanks for the new post, Sue Bee!